*Info Compiled From U.S. Consumer Product Safety Commission And The E.P.A. What Does It Cost To Test For Asbestos? 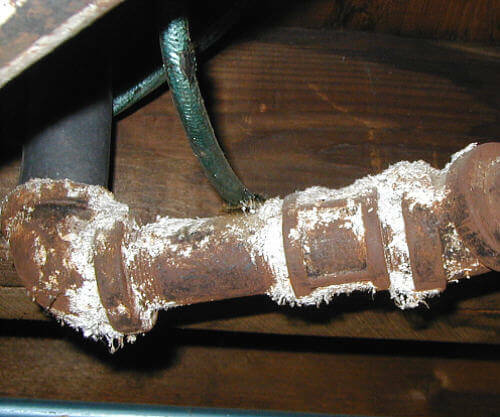 The above photo shows a typical asbestos insulated heating pipe found in older homes. During the twentieth century, some 30 million tons of asbestos have been used in industrial sites, homes, schools, shipyards and commercial buildings in the United States. There are several types of asbestos fibers, of which three have been used for commercial applications: (1) Chrysotile, or white asbestos, comes mainly from Canada, and has been very widely used in the US. It is white-gray in color and found in serpentine rock. (2) Amosite, or brown asbestos, comes from southern Africa. (3) Crocidolite, or blue asbestos, comes from southern Africa and Australia. What is common to many asbestos-containing products is that they were (are) used to contain heat (i.e. thermal insulation.) This was the main reason for their use. It is impossible to list all of the products that have, at one time or another, contained asbestos. One of the most common products asbestos is found in, is in the insulation material found on heating pipes and ducts of homes built before 1960. Some of the other common asbestos-containing products are insulating cement, insulating block, asbestos cloth, gaskets, packing materials, thermal seals, refractory and boiler insulation materials, transite board, asbestos cement pipe, fireproofing spray, joint compound, vinyl floor tile, ceiling tile, mastics, adhesives, coatings, acoustical textures, duct and pipe insulation for heating, ventilation and air conditioning (HVAC) systems, roofing products, insulated electrical wire and panels, and brake and clutch assemblies. People who have frequently worked with or around asbestos (such as plumbers, building contractors, heating contractors and home inspectors) often are able to make a reasonable judgment about whether or not a material contains asbestos on a visual inspection. Many profession home inspectors also can make a reasonable visual judgment. To be absolutely certain, an industrial hygienist would have to make the identification. If a client elects to have laboratory analysis performed by an industrial hygienist for asbestos as part of a home inspection, the fee charged by Able Home Inspection, Inc. would usually be $125 for one sample and $50 for each additional sample tested. The results of the testing would usually be available within 48 hours. In most cases, asbestos containing materials are best left alone. When it is necessary to disturb asbestos, you should contact a licensed asbestos contractor. Remember, do not dust, sweep, or vacuum particles suspected of containing asbestos fibers.